ABOVE: An alphorn trio calls to the cows. The alphorn is one of those instruments, like the double-bell euphonium, that non-aficionados have trouble taking seriously. 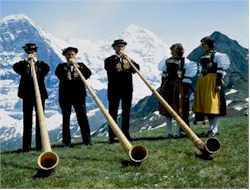 Yet the alphorn has been around for nearly 500 years: first as a means of communications in the high alps, and later as a musical instrument that has been featured in works by composers like Brahms and Leopold Mozart. Alphorn maker Christian Schneider reports that a music teacher named Herr Huber organized summer alphorn courses at the request of Bern's mayor as long ago as 1826--a step that guaranteed the alphorn's survival not only as an instrument, but also as a Swiss national symbol. As the accompanying photo shows, the alphorn is a remarkably simply instrument. It consists of a long flaring spruce tube with a mouthpiece--and that's it. No valves, no keys, no holes, no spit valve. Yet its very simplicity (as well as its size) makes it a difficult instrument to play. Christian Schneider claims that "The apprenticeship for Alphornplayers runs to approximately two years. One should be able to concentrate oneself fully on that for this time." Herr Schneider recommends that purchasers consider the standard Fis-Ges (F-sharp/G-flat) alphorn, measuring 3.40 meters (about 11 feet) long, over other models that range from 2.2m to 3.9m in length. This size has a "clear and resonant, but also typically soft" sound, and "in its three-part construction it matches well into a car's boot." He adds that the F-sharp alphorn is well-suited for playing with organs, brass bands, and orchestras. If you aren't ready to invest in such a specialized instrument, or to attract the attention of local cows and neighbors with two years of intensive practice, it might be wiser to simply enjoy an alphorn concert during your trip to Switzerland. Check with local tourist offices for folklore shows, especially in German-speaking Switzerland, or visit the Restaurant Stadtkeller in Lucerne (see Web link below). This archived article at SwissInfo.ch describes a weekend course at Fritz Frautschi's Alpine Atelier in Schönried, Schwyz. William Hopson, a French horn player in the Calgary Philharmonic Orchestra, builds his own alphorns--and despite being a foreigner, he earned rave reviews with an alphorn performance at the 1997 Cantonal Festival in Berne. Sure, it's a tourist show, but why be a snob? Enjoy alphorns, yodeling, cowbells, and other folk music with lunch or dinner in the vaulted dining room of this historic restaurant. Yodeling is to Switzerland and Austria what the Beach Boys are to Southern California, or what hog calling is to the Ozarks. Listen to "the language of the mountains" (or even learn how to yodel) before you leave home.